I thought it'd be great idea to try this out due having a past of buying clothes and either not wearing them or wearing them once or twice and then they find their way to the back of the wardrobe never to be worn again and trying this meant that I would hopefully save money and only end up buying pieces that I love and will wear time and time again. 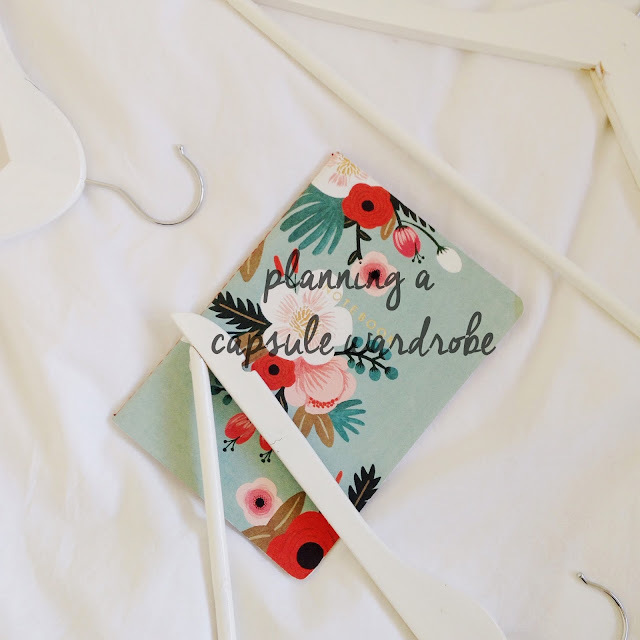 During the time of trying this idea out, well hopefully sticking at it forever, I'm hoping that I'll end up saving money as another idea that comes from the capsule wardrobe is that you only shop for clothes 4 TIMES A YEAR, that being every season so that you can have new pieces to keep you warmer or cooler depending on the temperature. Also when you go to shop for items another rule is that you set your self a budget and you CANNOT go over it! I'm thinking of setting my total to £250, which sounds a lot but when you're only spending that 4 times a year it'll probably end up you saving money rather that potentially wasting a lot more. I am worried that this will be a big flop and I won't be able to refrain from shopping as shopping is probably a big hobby for me as I like to be able to photography my new purchases for the blog and I'm worried it will hinder my blogging, but hopefully I'll be able to create numerous outfits, all that look a little different and that don't bore me, because again that's a big worry, I'm forever getting bored with my clothes, but then again this could be because I'm not buying pieces I actually love, but instead purchasing mediocre clothing to "fit in or keep up to date with the blogging world" When really it's important to find the style you feel comfortable wearing and taking photos of your style, because it shouldn't matter weather you have the latest skirt or top, what people want to see is how you style things and if you style it in a way that makes you feel stylish and that others enjoy seeing then that should be enough. Obviously throughout the season you'll be swapping items in and out of your wardrobe so in reality you will actually have more than the number of clothing pieces you decide to work with, but I mean during autumn/winter I'm not going to want shorts and little dresses and so they'll be put away and in turn will be replaced with jumpers and either warm dresses or more bottoms, as well in the summer I'll be wearing sandals and things, but come the colder seasons replacing those with boots and warmer shoes, all the while staying at the 39-42 items. Also it is wise to state that like Caroline I am not including jewellery, bags, underwear and workout gear into the equation and I may even have a few pieces of "going out wear" that I won't include due to one, I won't be taking photos of those items and two they will only make appearances when I go out for drinks and things at night. What I'm hoping for at the end of this project is that I end up finding my style, creating a wardrobe I LOVE and in the long run saving money for "things that really matter" as Caroline says as I feel that that is important. Before I end this post I'd just like to say, that although I have taken the rules and information from Caroline, I have adapted them in the hopes what I've decided will work for me, you do not have to follow it exactly, for example it's not set in stone you only have 39-42 items as Caroline works with 37 items. The amount you wish to spend is also up to you and lastly, everyone's style is different so if you want a wardrobe full of colour and patterns, or just plain minimalist clothing then the choice is up to you! So what's your opinion on this idea, do you want to give it ago? Then check out Caroline's blog for inspiration and keep checking my blog back to see my journey! This is something that I've wanted to do for a long time but I haven't yet found the willpower or the time to trawl through all the pieces in my wardrobe. I'm hoping to do this something in the next month or so though. De-clutter! This sounds like a great idea! One thing that has been helping me with defining my personal style (to avoid shopping regrets) is to have like a mini scrapbook journal where i keep looks and peaces i find in magazines and would like to have. Like that I've been able to keep in mind what would look good (or awful) in my closet and only buy a few new peaces from time to time.